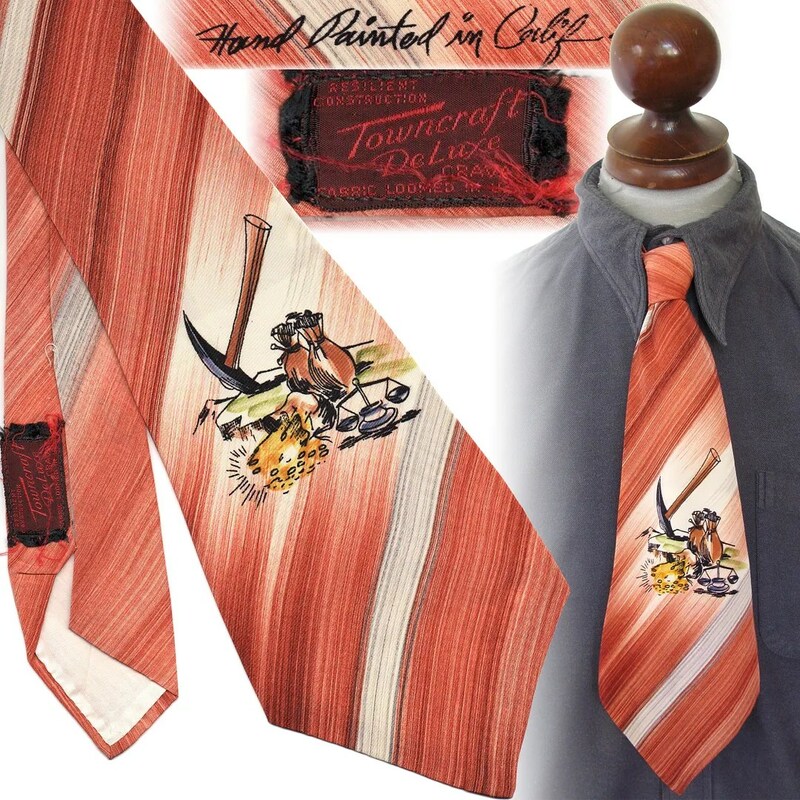 This vintage tie was hand painted in California and was sold by Penney’s under the Towncraft Deluxe label. It has a mining/prospecting theme, with a pick, scale and bags of gold. It measures 53″ long and 5″ wide. 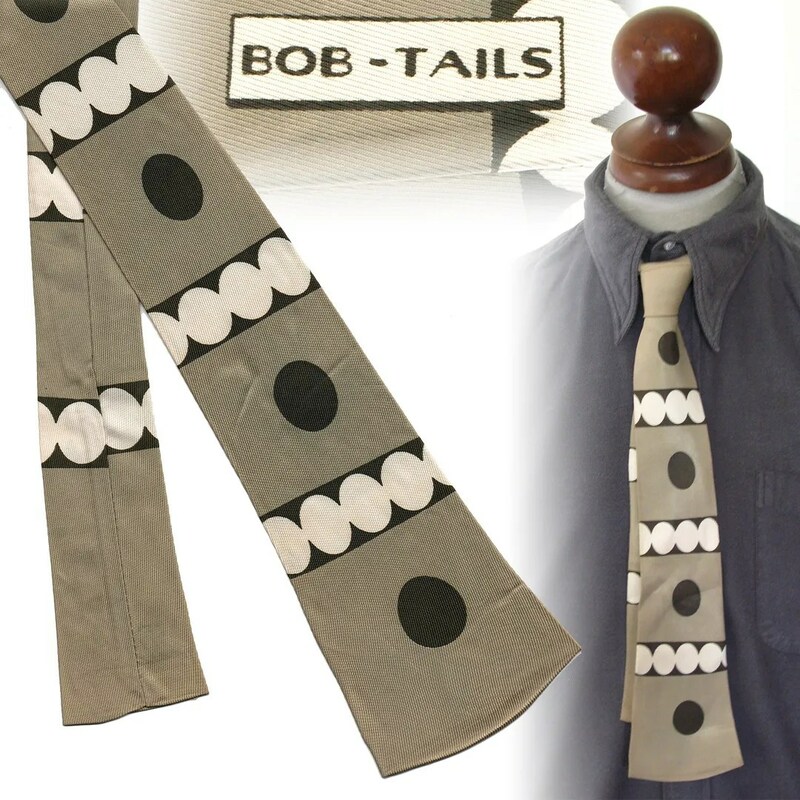 It is made of an acetate and nylon blend. 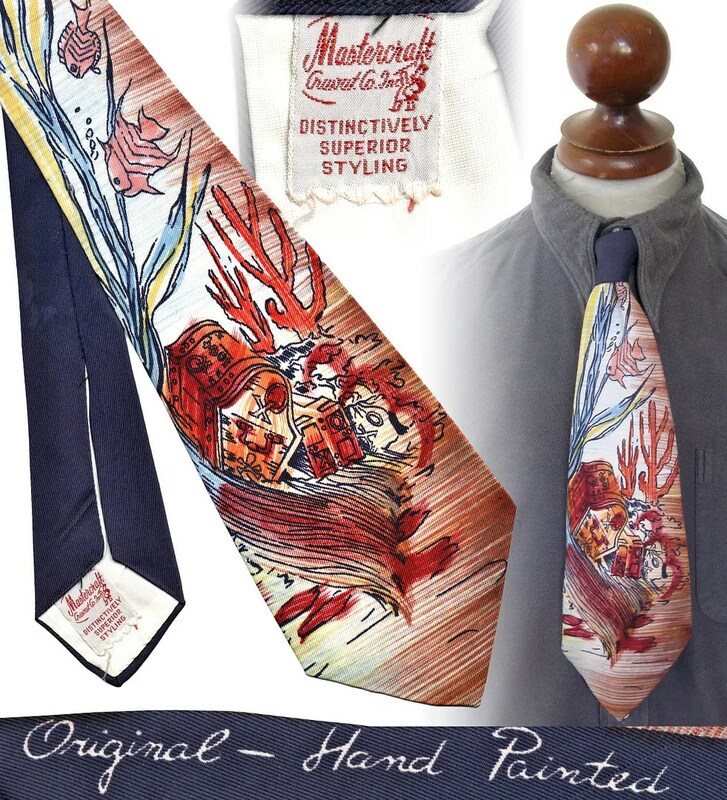 This vintage tie was made in the 1940s by the Mastercrat Cravat Company, Inc. It is hand painted, with a pirate chest and fish theme. 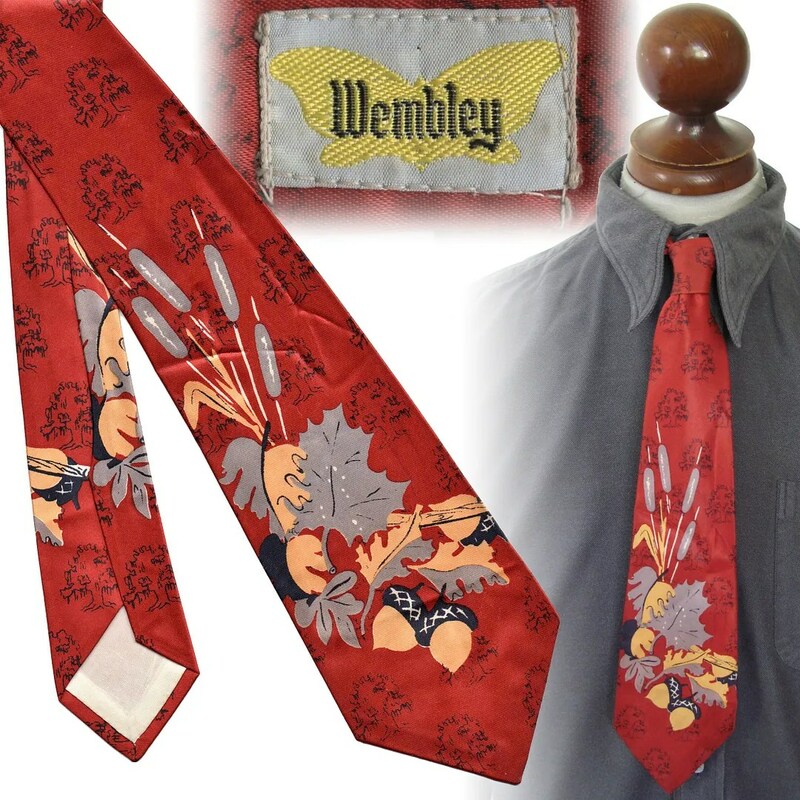 The tie is knot panned. It measures 4-1/4″ wide and 51″ long. 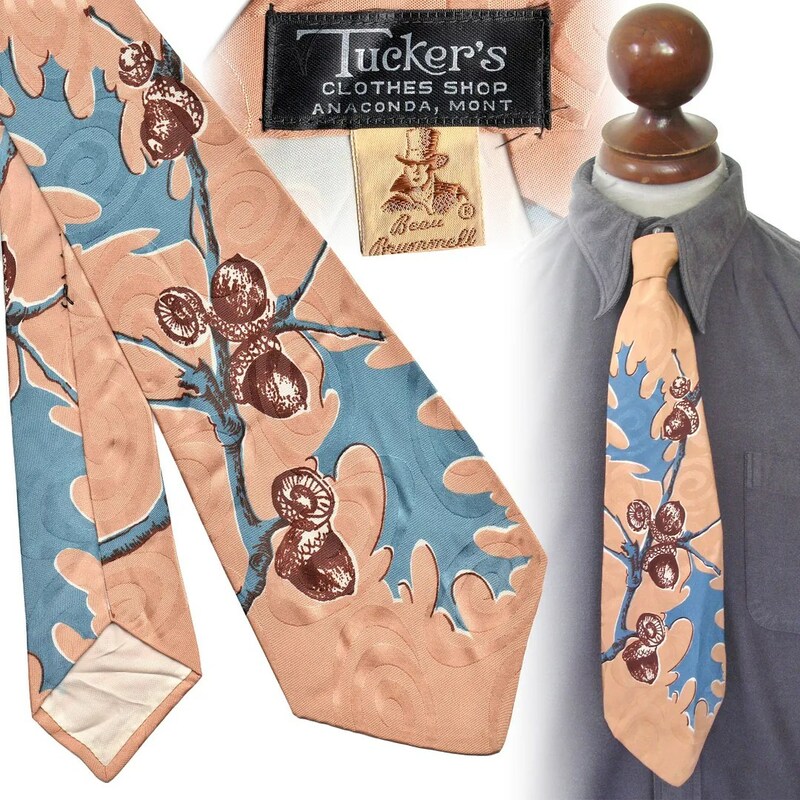 This vintage necktie was made in the late 1940s by Beau Brummell (famously also the makers of Palm Beach Cloth neckties), and was sold by Tucker’s clothes shop of Anaconda, Montana. It measures 4-1/4″ wide and 52″ long. 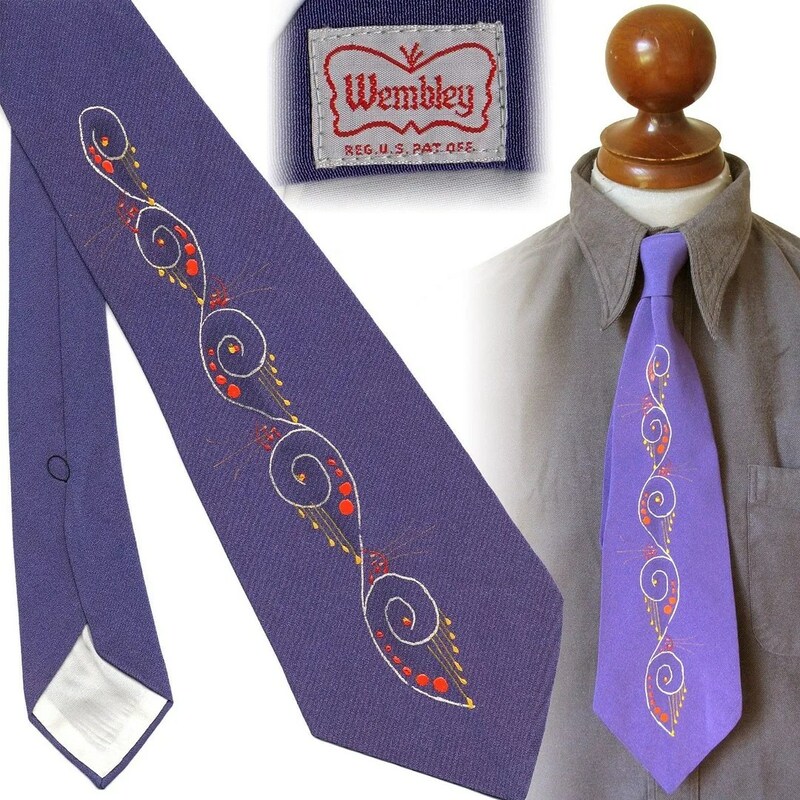 An unusual hand painted pattern on this one. Looks to me like an abstracted cactus of some sort. 4-1/4″ wide, 54″ long. 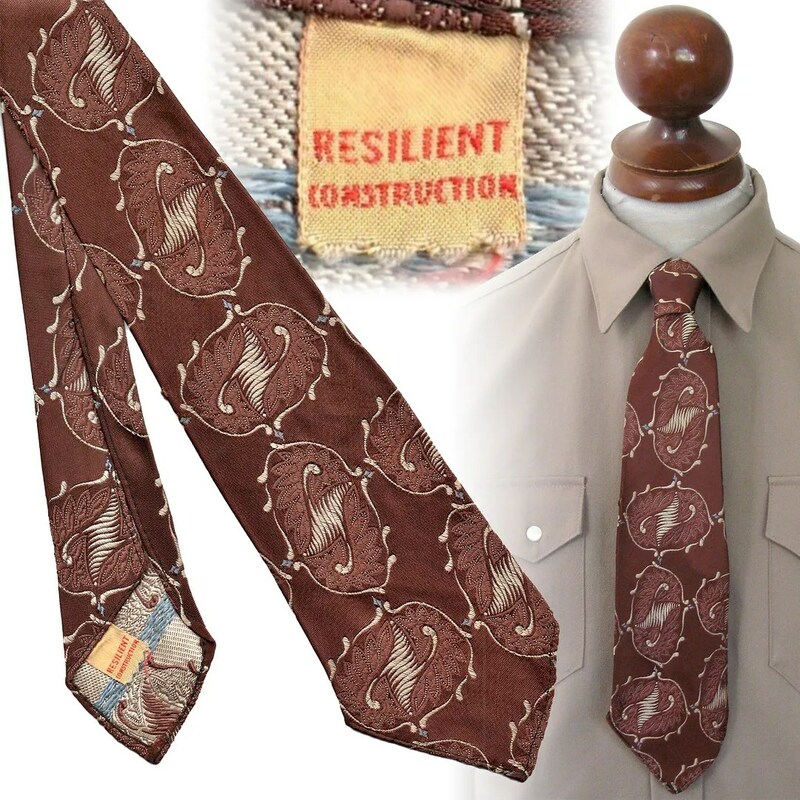 This vintage brocade tie has a repeating abstract organic pattern, in brown and white with a subtle blue accent. 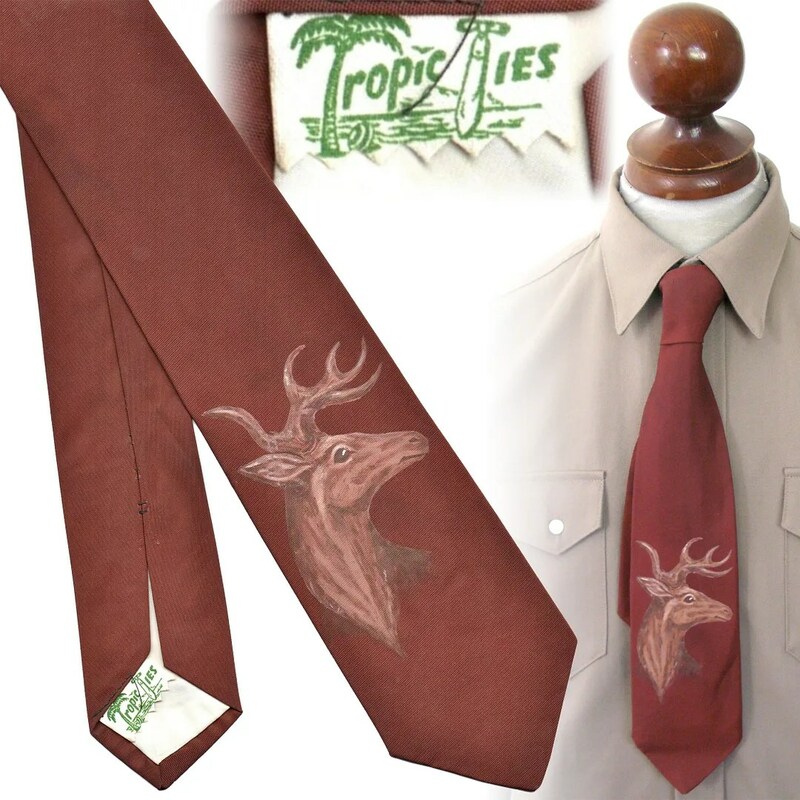 It measures 3-1/2″ wide and 48″ long. 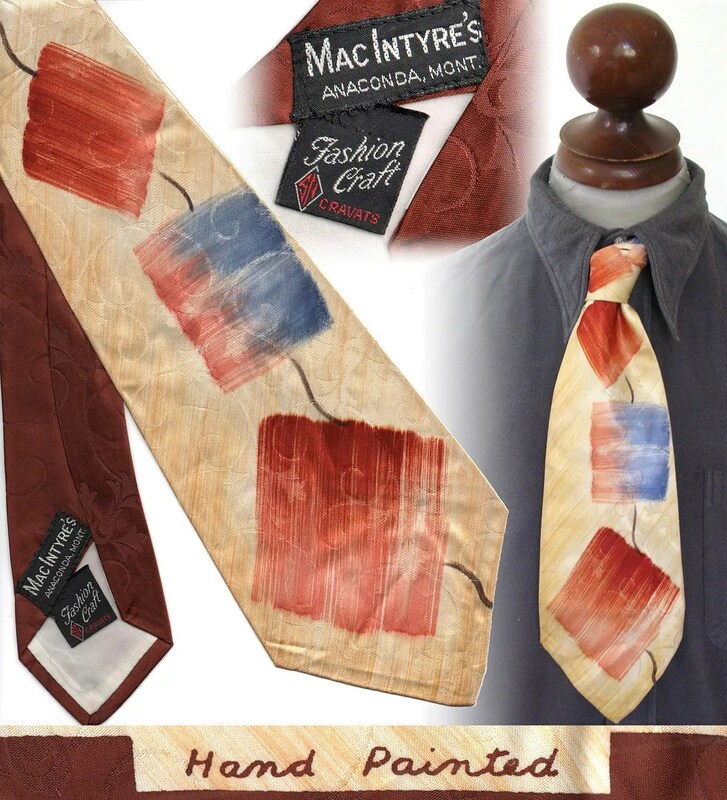 This vintage tie was made in the 1940s by Fashion Craft Cravats and was sold by MacIntyre’s of Anaconda, Montana. 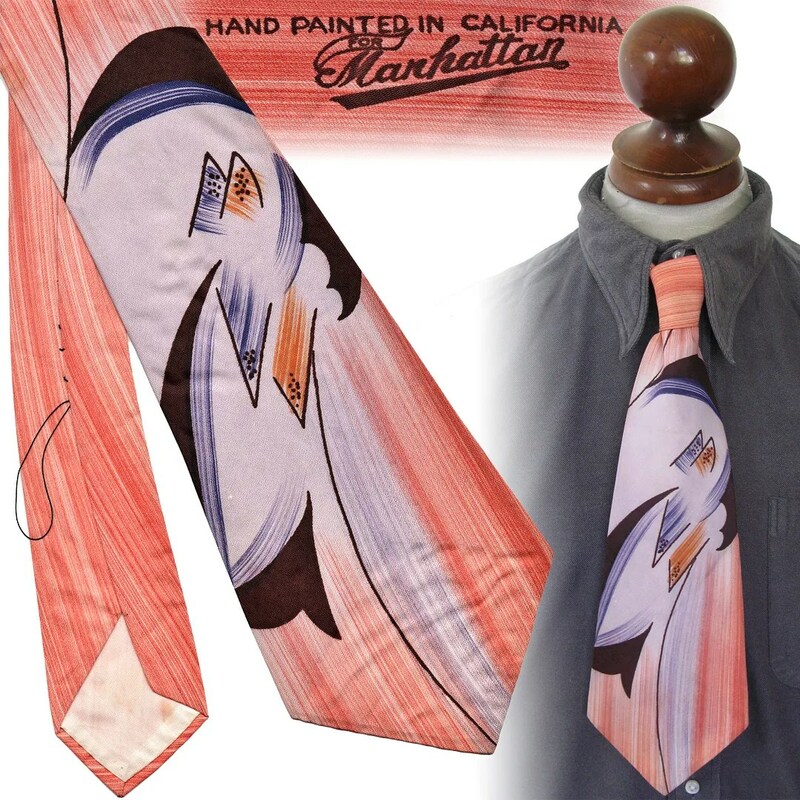 It is hand painted, almost certainly in California, and was made using Resilient Construction. 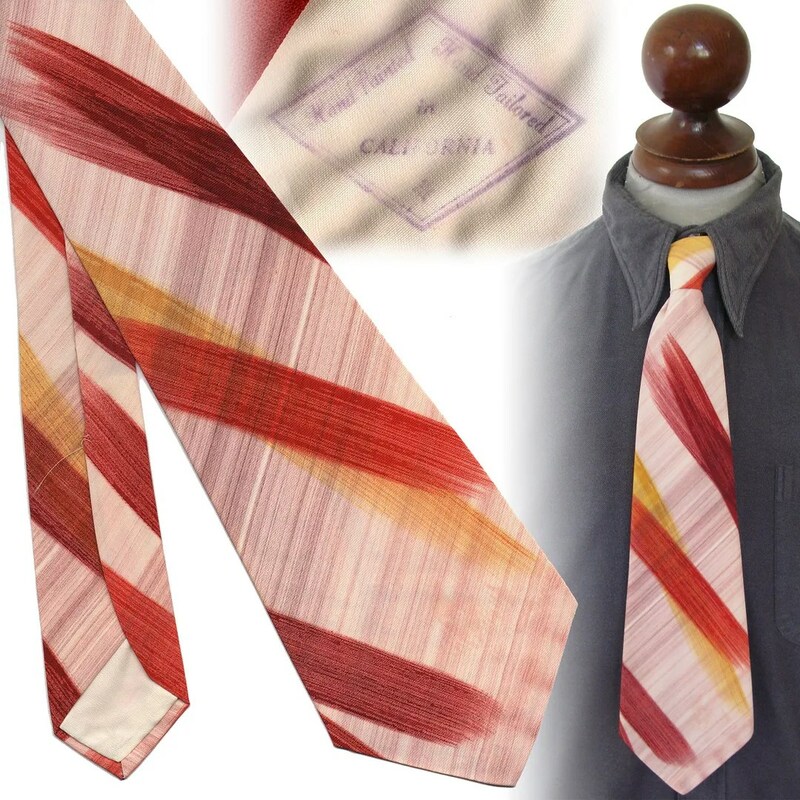 It looks as though it was intended to have been a knot planned model, as the back blade is a contrasting color, but the tie is constructed in such a way that it does not line up with the knot, regardless of the style of knot used. 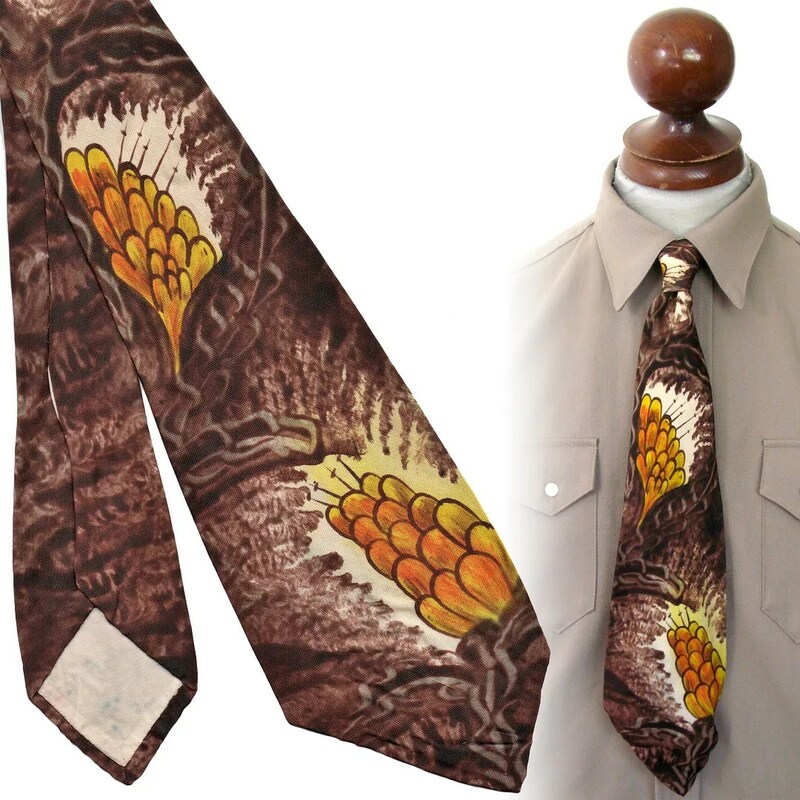 The tie measures 49″ long and 4-1/4″ wide. 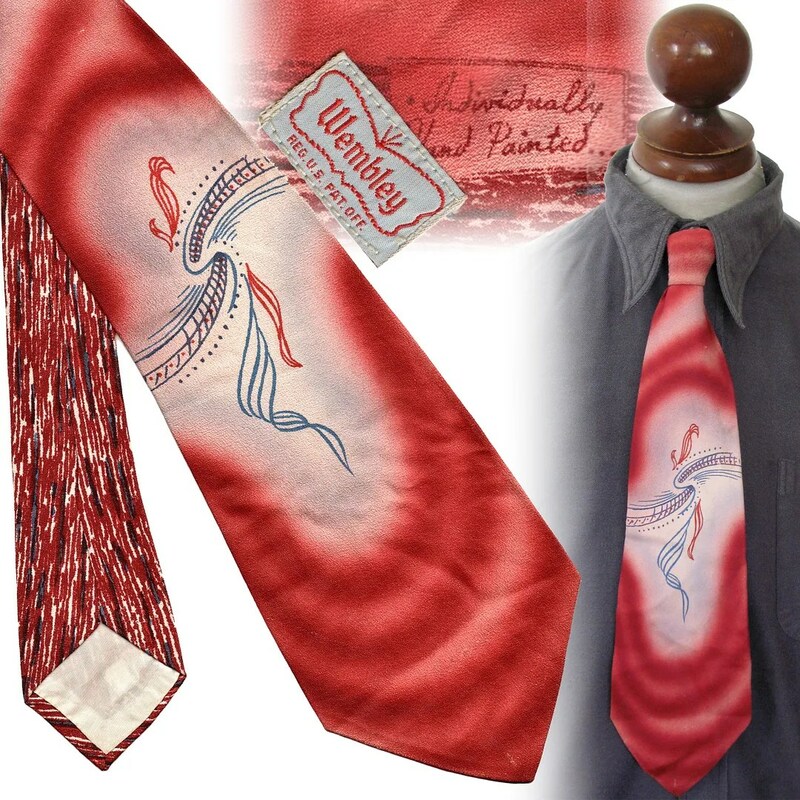 This entry was posted in Accessories and tagged 1930s, 1940s, 1950s, belly warmer, clothing, fashion, figural, hand painted, knot planned, loud, mens, necktie, style, tie, vintage by Spencer Stewart. Bookmark the permalink.